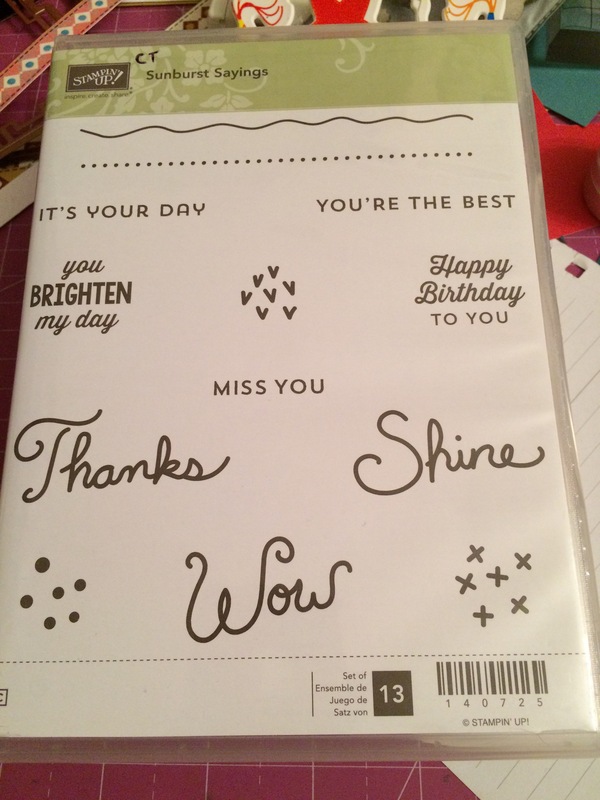 Well, my first foray into using Stampin’ Up’s Embossing Paste was certainly interesting. It’s been sitting on my desk patiently waiting for me to get to it. I finally got the paint palette and palette knives, and I already had ink refills to tint it with, should the mood strike. This won’t be too hard, right? I thought. Hmm. Tonight the mood struck, when I was permitting myself a little dabble time before attempting to go to bed at a reasonable hour (since I’m on book deadline again). I had a salt-and-pepper love-themed notecard I wanted to add some hearts to as a border, and I thought the thick embossing paste would show up better rather than ink of the same color on a stamp I was waffling on. Well. Apparently I have to figure out how not to let it bleed underneath the stencil. That seems to be my main problem. I had washi-taped down the edges of the first stencil (and card), which was created from an edge punch, and even kept my hands on all of it as secondary security, but still I erred. The heart borders weren’t terrible, though I don’t like the smudges at the bottom. I think I went over them three times. And once the paper is smudged with the color, it’s definitely hard to remove it. I forgot to mention that I had put a little bit (probably too much) with my palette knife into my paint palette and added a drop – and then two drops – of Sweet Sugarplum ink refill (SU, current product, In-Color). I’m going to guess that one drop is enough. I was trying to match the color of the SU heart enamel shapes because I already had one on the card. Two drops definitely made it darker. So then I thought maybe I should add more paste to spread out the color more and make it the lighter shade I was going for. That meant there was a whole lot of embossing paste in my palette tray, more than six hearts would require. And mixing all that with my metal paint palette was difficult and sounded like scratches on a chalkboard. Perhaps a foam board or toothpick next time. But in doing the “Be You” stencils on cardstock and then on DSP, I had a lot more problems with runs beneath the stencil. Granted, things were starting to dry while I searched for more stencils to use up the excess I’d made, but I thought I had time. Maybe I should have added a drop of water to keep it thin? No idea. Will have to research that. I did find that once the paste was partially dry, I could take a tool and scrape off the excess around the letters…and the piece of black background/polka-dotted paper hid that a little better than the grey cardstock. Still not perfect, though. But manageable. 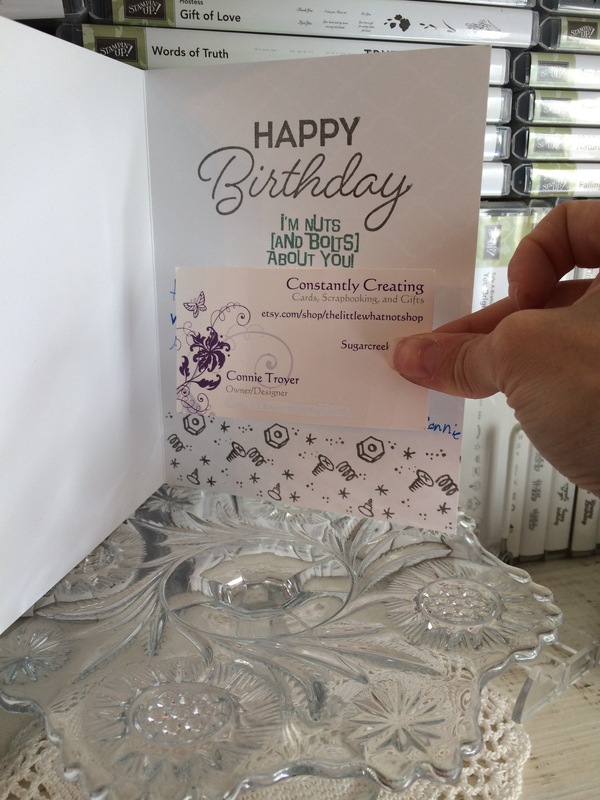 At this point I’m thinking of taking my Cutterbee scissors and fussy-cutting around the gray cardstock example. Seems like it’s drying pretty quickly. I can’t scrape off anything around the hearts anymore. 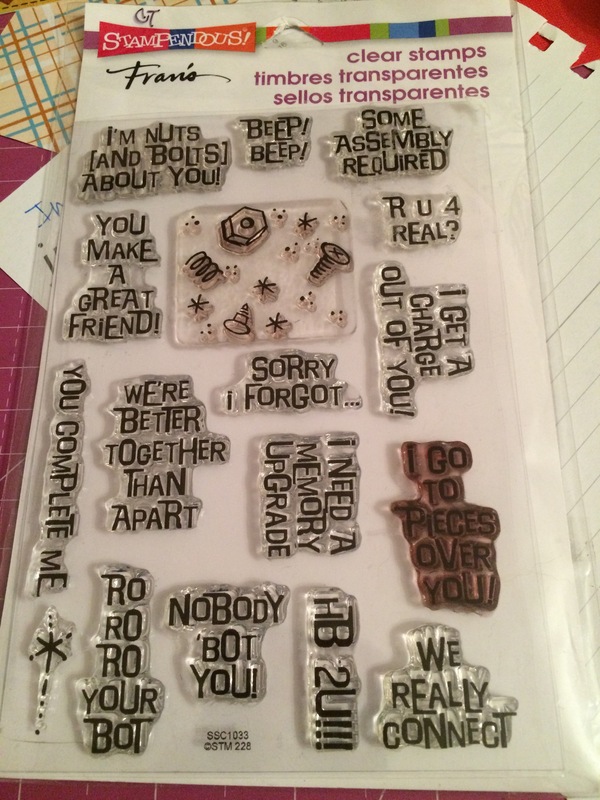 It would let me pat the “Be You” letters back into place by hand when I was trimming those with my Creative Memories sticker placement tool (use whatever you’ve got, right?). Then I tried to wash off my tools. I think I should have done that immediately. I stood at the sink scraping off the stencil (which had been used twice then) with my fingernail, under running water and even soaking it in the sink. I couldn’t get it all off, and I bent a bit of my stencil as well. 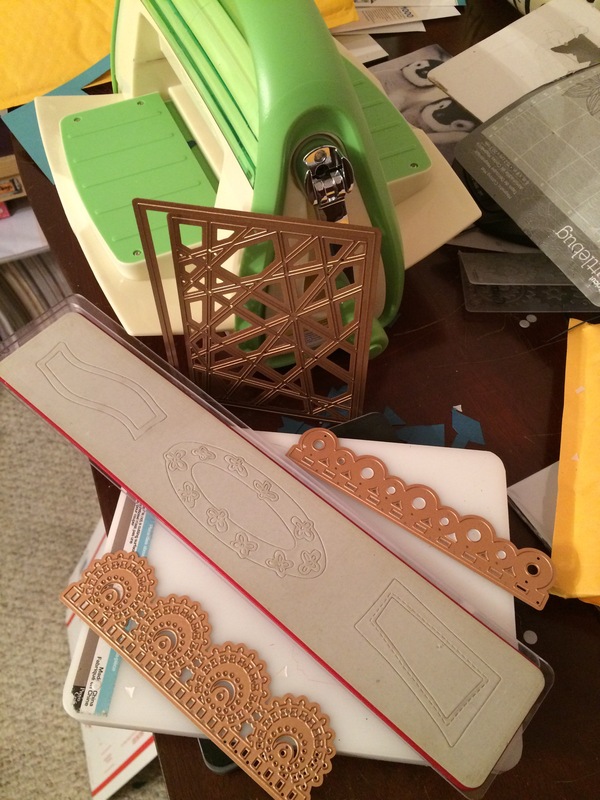 So, I’m looking for tips on just what to do or not do with stencils and embossing paste. I’ve figured out that a little ink goes a long way and the paste dries fairly quickly, and obviously I need to clean the stencil earlier – but how do I get it to stop the bleeding? Thinner, repeated layers? I like height. 😦 I couldn’t see how to washi the close parts down either. If you have advice, I’m all eyes. Thanks in advance. It has to get better than this! It leaves such a cool 3D look when it’s actually all smooth. I’ve wondered, too, whether the embossing paste (tinted or not) would work in silicone molds like SU’s retired pressed clay molds or the current Mod Podge molds sold in various locations. Any clue? 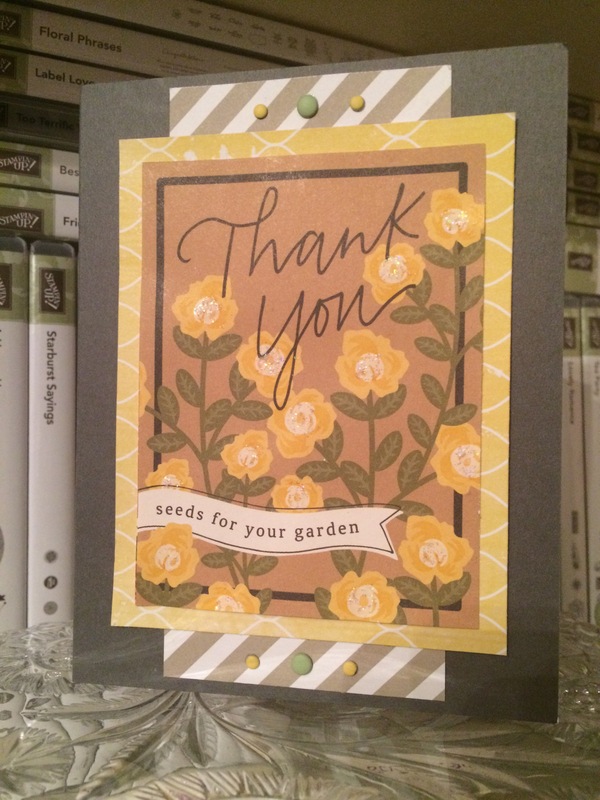 A simple (and overdue) thank-you card using American Crafts, Glitz, and Stampin’ Up products. Sometimes life gets ahead of me and I get behind on doing the seemingly easy, necessary things in life. One thing I’m really bad about is sending thank-you cards. It’s not that I’m not grateful or that I don’t think of the sender every time I see or use their gift…I just fail to tell them how much it means to me. 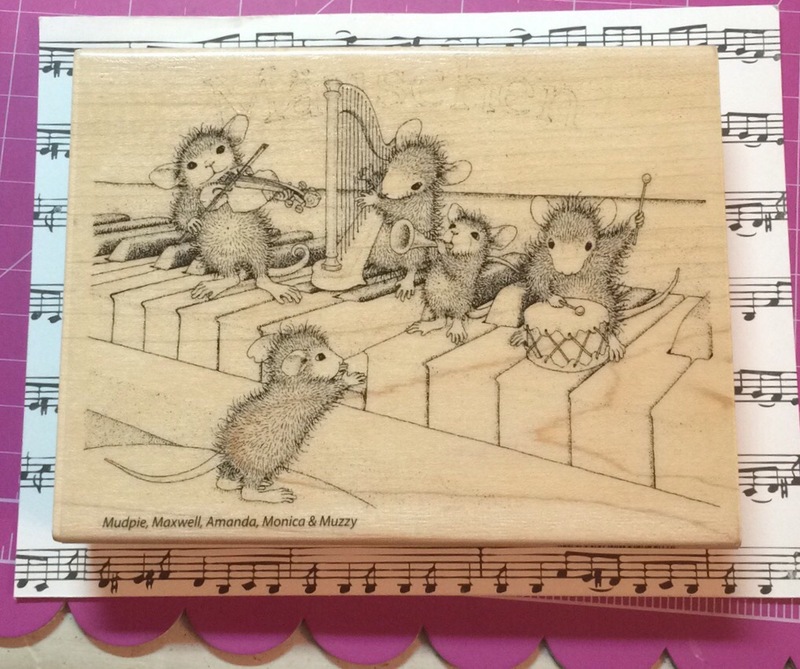 I often feel at a loss for words or inadequate when trying to compose all the feels onto a tiny 5-inch card. I could blame my parents (though I won’t), as I never had to write thank-you notes for gifts received. (Maybe because of that, receiving them just isn’t that important to me personally. As long as I know they got my gift, I’m good.) I’ve finally conceded that I’m wholly out of practice and singularly bad at composing them – and 100 percent a procrastinator. I’d rather the words magically flew onto the card and into the mailbox without my fumbling assistance, while I hope they pass muster. Not to mention that writing them out now kills my fibromyalgic hands. A card and a half, give or take a half, and I’m done in with hand cramps. I love the gift; I love the sender; I hate the card that follows. I’ve been having a pretty busy year. 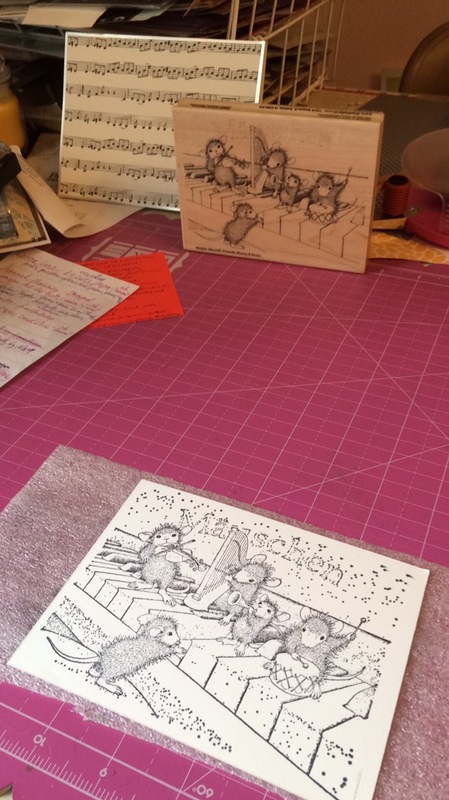 I’ve flown a handful of times, once out of the country, been to board meetings twice, made a half-country trek by car once and not-as-long other car trips at least twice, said goodbye to a dear uncle, crammed in editing projects, and continued to take and finish custom card orders through it all. It’s starting to feel as if I can’t stay home long enough to get ahead on anything. Enter the now-very-behind thank-you note, which I had to make and send for the reasons above. I’m just about out of brain cells at this point. I knew how I wanted to make the card once upon a time. I laid it all out in a heap on my desk, to signify to myself that THIS was how it was going to go. And somewhere along the line other projects joined it and other work also had to get done, and the long and short of it is that by the time I finally had to shake myself out of the procrastination coma and send the blooming thing, I had only a semblance of an idea of what I was supposed to be doing with it. Plus I couldn’t find the burlap piece. Hubs decided to join me in the craft room that night, and we watched a movie on my not-so-used TV while I fiddled with the card, trying to come up with some new design. The card is pretty simple, or at least it looks it. I grabbed a leftover base from my stash of unused Basic Gray baby-invitation bases, hoping I won’t regret that decision when I work on her baby album next year; I liked how the darkness of the outline of the flowered piece matched. And then I just rearranged card pieces in front of me until something made sense. I think I actually meant to do something else with it, but the sizing on the striped paper was perfect as it was and rather distracted me, so I ended up completely forgetting that I meant to go the other direction. I tried a number of compilations, but in the end, this is what made sense to my boxy self. 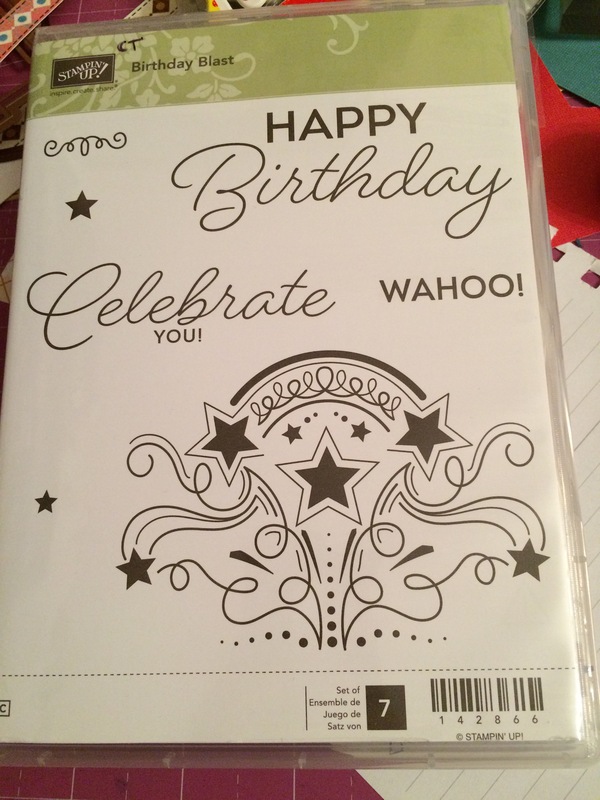 The striped paper is from Stampin’ Up. I needed to have some sort of color separation and size difference between the flowered piece (which is from American Crafts, 320490) and the stripes, so I ended up using a yellow remnant from Glitz Design that mostly matches the yellow in the flowers. I had a better color match but didn’t like the pattern or size nearly as well. I added “bling” in the form of something akin to Stampin’ Up’s Candy Dots; these yellow and green dots are from SU’s “Little Moments” Project Life Accessory Pack. It always amazes me how colors across completely different designers can still match. Or maybe it’s more amazing that I actually manage to pull them all together on a card. At this point I decided the card was too simple or plain. I have this fight regularly with myself. One side of my brain says it’s fine/nice/great/perfect the way it is and shouts at me to leave it alone, and the other side of my brain hesitates and weighs things and just isn’t convinced, thinking it’s not quite right yet – more tinkering needs to be done. The latter won that day. I have a bottle here of SU’s Dazzling Details glitter glue in an iridescent whitish color, and I’m not sure I’ve ever used it much. This became evident when the glitter glue came out in nonspreadable clumps instead of a smooth flow. I did my best at smooshing them out onto the flower centers while I mumbled that I should throw the bottle away, but I persisted. It was better than trying to find a similar color in my Stickles from Ranger. 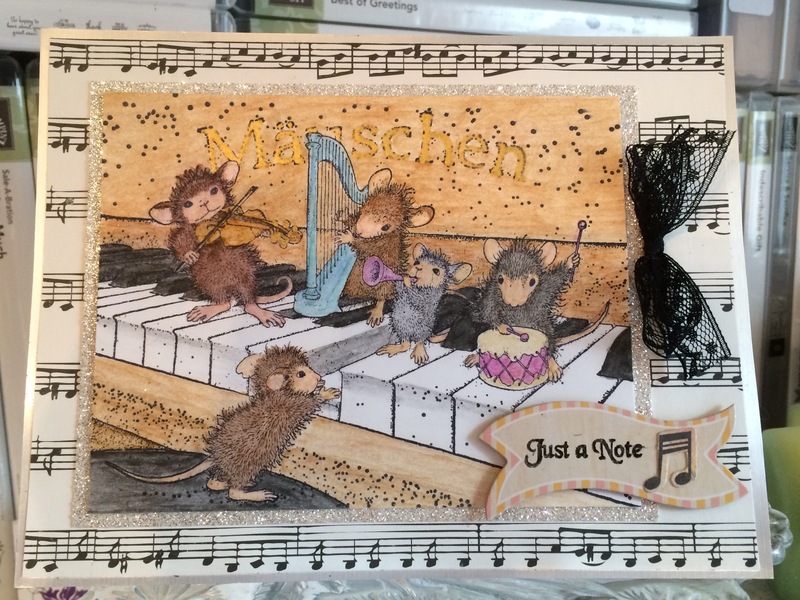 I finished the centers, leaned back in my chair, put my feet up, and watched some more of the movie before going on to create the inside of the card. And right after I flipped open the card and got glitter on my fingers, I remembered that the glitter glue on the flowers would still be wet. (I like to take an entire day to dry them, if I can.) So I muttered some more, closed the card, got out the bottle of glitter glue from where I’d put it away, and proceeded to redo the flower centers. Eventually the inside did get finished. 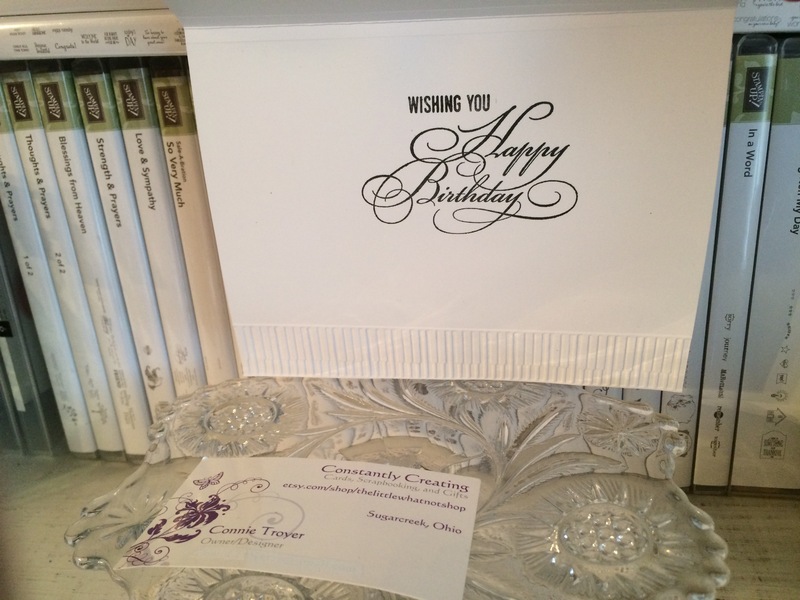 I’m just now realizing that I forgot to take a picture of it – the urge to mail the card was finally the foremost thing in my mind, apparently – but it was just a white piece to write on and a couple of leftover strips of paper as bottom borders. And, as usual, I didn’t have enough room to write all the heartfelt thoughts battling in my head for the 5-inch piece of paper. Sigh. At least this one is finally done and gone. I’m relieved that I no longer have to remember to do it. Until next time, that is. 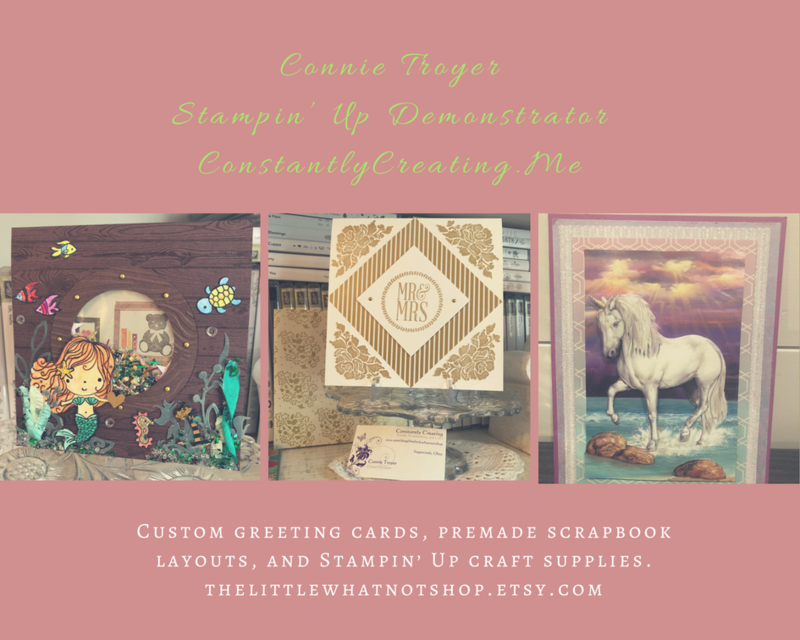 I’ve been on book deadline this past week and will be again next week, so I haven’t had much time to play in the craft room even though I have several cards I need to make and send out. I finally HAD to make time to squeeze in one for my nephew’s birthday since the party was tonight. My day wasn’t going that well, honestly. I’ve felt better physically, I’ve thought more coherently, and it seemed like I had a case of the dropsies, where I couldn’t hang onto things with my fingers. Imagine crafting when you drop every other item. Those are the days I pick up a book or occupy myself otherwise instead of crafting. But for this card. Regardless of how frustrated I was, it wasn’t making itself. I’d been thinking of how I wanted to lay it out all week. I have these awesome gold metal gears that I thought would look great stacked and staggered in a couple of corners, and I couldn’t wait to use them. Well, even though I saw them recently, I still have to wait to use them, because I can’t figure out where I stashed them. And that was just the beginning of the frustration. Alas, some cards go like this. I put the die that did work in a metallic foil cardstock, which turned out well. Didn’t fully cut again, but I liked the look even with the additional pieces. 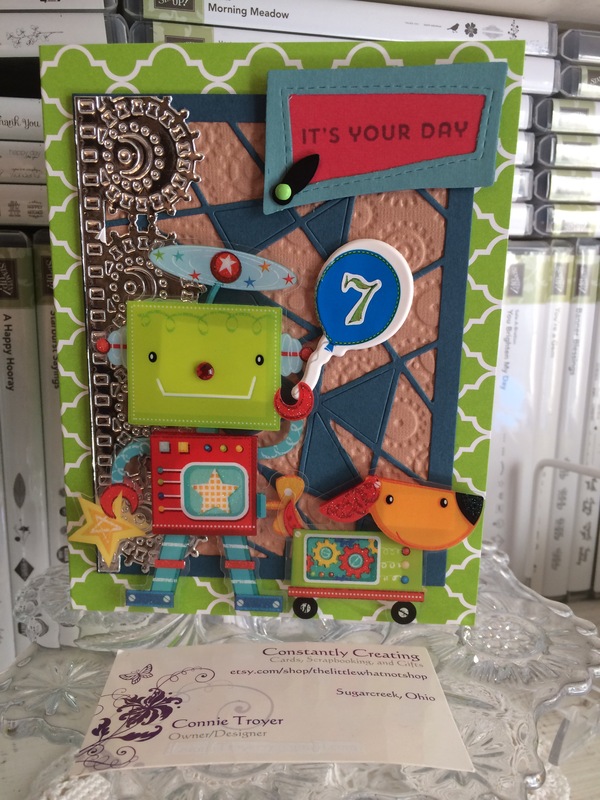 So there I was with my SU Not Quite Navy cardstock mosaic die-cut piece on top of the embossed tan gears, both hovering above the 5×7 green Moroccan-patterned card base. NOT what I had imagined for this card. (I only have ten types of premade card bases. I often make my own, but whatever was the shorter route to finishing the card had my vote today.) I decided to fill in some of the mosaic holes I’d already taken out, thinking it would look better. I really wanted to add in a red color to the mosaic but didn’t want to fight that die again, so I went on. Looking at the combination of those four elements almost made me nauseated, but I’d taken too long at that point to reverse direction. It was time for robot stickers. And then to look for a balloon so the robot didn’t appear empty-handed – plus I wanted to fill in some of the space below the sentiment but above the dog. The brand-new sticker pack that held my balloon then stuck to the inside of its plastic, so I’m not sure how many of those are even useable any longer. But at least the balloon didn’t suffer. The sentiments were the easiest part. Finally, something going right! I stamped four different ones and didn’t mess up at all, even with my cloudy thinking and growling stomach. So that tells me I’ve actually improved on my stamping. Practice makes perfect! I used SU Basic Gray Archival ink and the SU Sunburst Sayings stamp set for the “It’s your day” stamp inside the stitched wonky square Sizzix die journaling box in the “Frames” strip of three dies, adding in the red color there and hoping the ink would be dark enough to cover it. It worked! All that was left was a number on the balloon and a metal photo holder with brad for decoration. It’s hard to see, but the robot and dog are actually popped up, as is the wonky square sentiment. And the balloon is a puffy sticker from SandyLion (PFOM10). I was thankful I wasn’t mailing the card. I moved on quickly to the inside, since I was supposed to be leaving my house for the party right about then. Stamped all three correctly in Basic Gray Archival ink and SU Lost Lagoon ink (hooray! No wasted time or covering up mistakes!). The “Happy Birthday” stamp is from Stampin’ Up’s “Birthday Blast.” “I’m Nuts and Bolts about You!” and the random nuts and bolts pattern I used as a border are from Stampendous/Fran’s (SSC1033). This is the second time I’ve used the Fran’s set and I like it very much. Here are pics of some of the supplies I used.